What do women want? According to recent survey results, women believe beauty products made with both natural ingredients and proven scientific technologies work best – and that’s what new beauty brand, mirra™ provides. *77 percent said products that have both natural ingredients and proven technologies, work best. Only nine percent said products with all natural ingredients, alone, were best; and 14 percent said the same of science only products. *Their description of a “bad hair day” was evenly split between “flat” (37 percent) and “frizzy” (35 percent). (15 percent said fly-away; 13 percent said oily). *The online survey was conducted by the Consumer Research Department at The Kroger Co. in October 2009 among 502 women between the ages of 35 and 54. Launching now, mirra products include shampoos and conditioners; hair styling products; body washes and mists; facial and skin care lotions, cleansers and cleansing cloths; eye firming and age defying creams; and cosmetic brushes. mirra products are made with natural ingredients, such as olive oil, aloe leaf juice, and cranberry, bamboo, honey and chicory root extracts. I was given the opportunity by Global Influence Network to try out some of the products for review. I got the box in the mail and I was like a kid in a candy shop. So many goodies in one box!! I like the thought of being beautiful and having perfect hair and flawless skin. But that doesn't happen very often for me. :) I don't take the time to use all of th ebeuaty products that I think it takes. But I was determined to give these products an honest try and keep up with the regimen. Which really wasn't anything at all. I had a shampoo and conditioner for my hair, a body wash, a face wash. Then an eye cream and face cream. That was easy enough. The smell of the shampoo and conditioner was a very soft fresh scent. The body wash was divine....honey. Need I say more? ;) The face wash was an exfoliant, which had apricot seeds in it, was very gentle and not harsh like others. And my favorite was the moisturizing face cream. It's made with bees wax and it made my skin feel so nice. 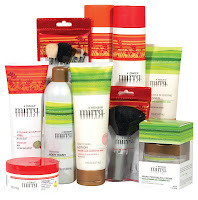 I really enjoyed using these products. I felt better about myself. Not quite the dumpy housewife and mom if you know what I mean. mirra products can be found in the beauty care aisles exclusively at all stores that are part of the Kroger Co. family. For a limited time, mirra is offering $5 off when you purchase any two mirra products. To download the coupon visit www.kroger.com\coupons. This is really great deal because you can get most products for about $3.99 each. To enter all you need to do it tell me what mirra product you would like to try by leaving me a comment below. US entries only. I think the face cream has got my name all over it!! Do you know if we have these at our Kroger in beaver? I'd like the facial wash, it'd be so much fun opening a box full of products.